Happy Monday! 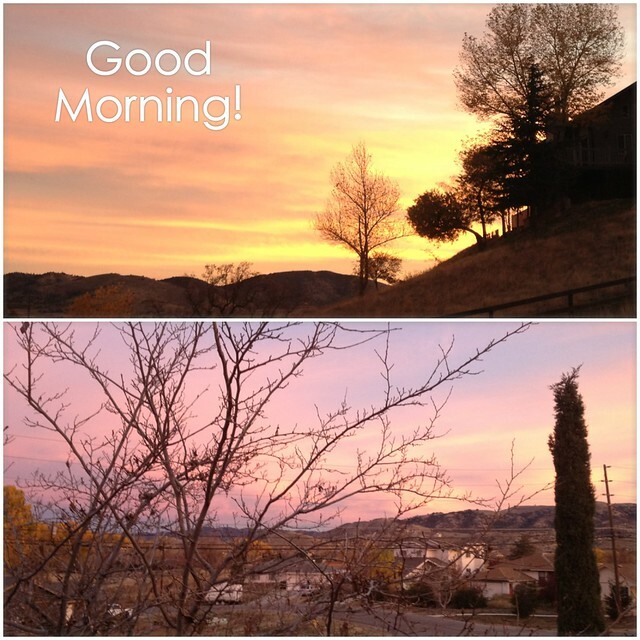 The photos above are from my bedroom window at about 6:30 this morning. When Blaine leaves around 4am on Mondays and Wednesdays, I usually have trouble falling back asleep so sit in bed for about an hour and then I just end up getting up. I love being up early, though, because there is something about sunrises that I love. They’re so pretty and while they look similar to sunsets, it feels much different. We’re working on getting some chairs out on the front porch so I can just sit out there while the dogs play in the crisp morning. I usually have to sit on the edge of the concrete porch which is waaay too cold. Today I’m spending the day relisting and packaging an etsy order, sewing up some of my orders from my pet bed business and then hopefully continuing to get my studio nice and organized. I do have quite a few orders to get through though, so I may just chug away at those all day to get ahead of schedule. My dad stopped by randomly on his way home from LA and we hung out for a while which was nice. We mostly laughed at the dogs playing in the front yard and we planned for me to come over for our Tuesday tradition, which is dinner at the Mulligan Room. Then I’ll probably hang out and watch a few of our shows, I think we’re going to start watching Terra Nova which I’m excited about. I have some updates and photos from Thanksgiving and our weekend that are in the works so I’ll be back with those today or tomorrow. For now, I feel like I’m procrastinating so I want to get going on my ever growing to do list.